The Chippewa Valley has no shortage of venues for your special day, from scenic parks where you can begin your married life surrounded by natural beauty to hotel ballrooms where you can wine and dine like stars. In fact, the number of options for ceremonies and receptions continues to expand. Here are four of the newer venues in the region that offer something unique for your wedding, whatever its size. 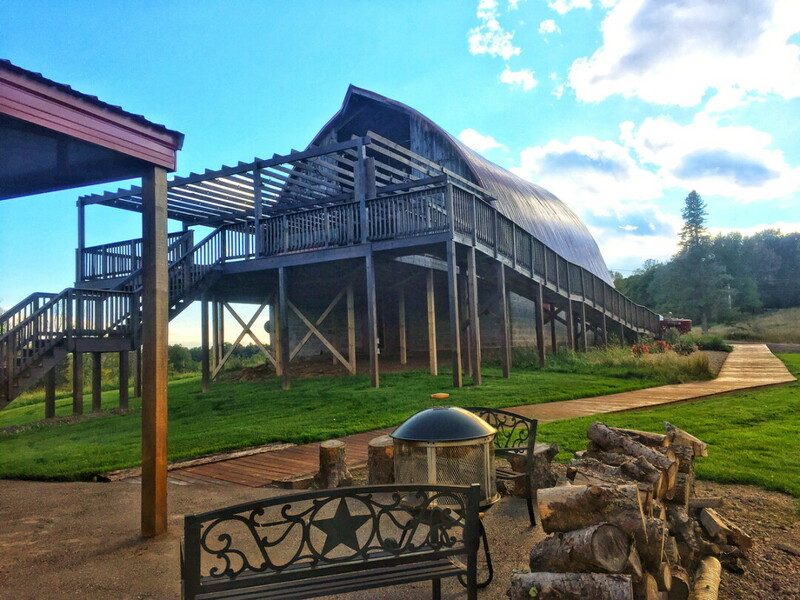 While searching for a retirement property for his parents in rural Chippewa County, David Zempel stumbled across something else: A rustic farm that could be transformed into the perfect barn wedding venue. After remodeling the barn – including raising it up to add a new foundation – and building a 4,000-square-foot pavilion, Alluring Acres became fully functional for weddings and other events in 2017. Zempel prides himself on providing the whole 50-acre property – which includes a house for the bridal party, 6,000 square feet over covered space in case of inclement weather, and plenty of land for parking and camping – to couples for a week at a time for a reasonable fee. “I wanted to create a venue that wasn’t going to set a couple back before they got married,” he said. Alluring Acres is flexible with which caterers and other vendors are hired for the wedding, and it offers a full bar (complete with liquor license), which can save couples a lot of money. The fact Alluring Acres is off the beaten path is an asset, Zempel said: Weddings there have featured everything from huge fireworks shows to helicopters landing and picking couples up – the kind of things that wouldn’t fly (literally) at other venues. Looking for a reception venue that offers an urban chic setting with hometown service? Look no further than The Condensery, a huge event center just south of Eau Claire in Osseo. The facility opened in mid-2016 on the upper floor of a former condensed milk factory built in 1903. (The building’s first floor is occupied by the Northwoods Brew Pub.) 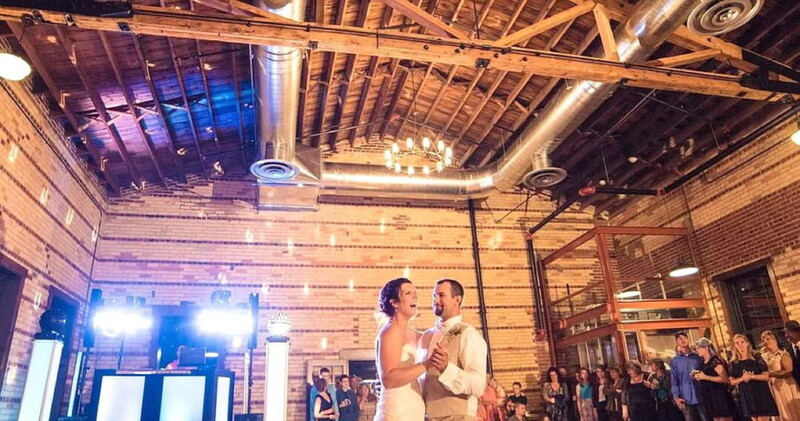 Extensive renovation exposed the century-old structure’s beams, hardwood floors, and brick walls, creating three large event rooms that mix the old-fashioned and the modern. “People say ‘We can’t believe we’re in small-town Wisconsin,’ ” explained owner Nels Gunderson, who was inspired to transform the building after attending his nephew’s wedding at a former oil refinery in Texas. The Condensery features three large rooms – 5,000, 4,000, and 3,000 square feet, respectively – allowing couples flexibility. For example, one room could be used for the wedding ceremony, the next for a dinner for as many as 450 people, and the third for a dance. The Condensery has proven popular: People have come from as far away as California and Texas to be married there, and 30 weddings are already booked for 2018. The venue has also been used for other celebrations, such as anniversaries, birthdays, and Christmas parties. River Prairie Center, the recently opened event venue in Altoona’s River Prairie Development, offers enormous flexibility for weddings, receptions, and other events. Set against the backdrop of the adjacent River Prairie Park and the Eau Claire River, the center offers indoor seating for up to 250 people in a rustic yet industrial space, an outdoor patio, indoor and outdoor fireplaces, a state-of-the-art sound system, floor-to-ceiling windows, a catering kitchen, and more. 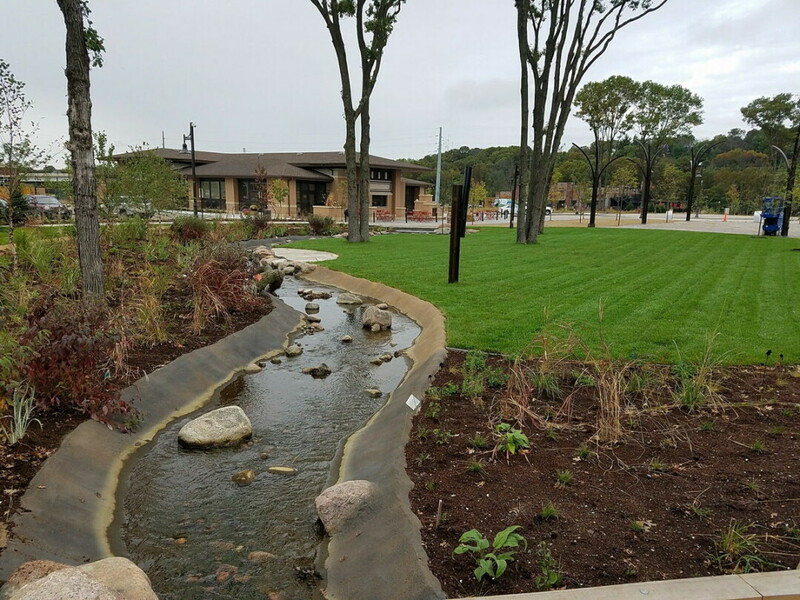 The access to the outdoors is a particular part of River Prairie Center’s appeal. Kirsten Bube, director of sales, notes that the center is adjacent to six spots for outdoor ceremonies and events (four of which were completed last year, two of which will open later in 2018). This variety meas your nuptials can be as massive or intimate as you’d like, Bube said. Among the spaces are the Bluff, which offers a peaceful view of the river and accommodates 150; Forever Garden, a landscaped area with mature oaks that can fit 400; Four Seasons Plaza, which is next to a manmade stream and offers a lighted backdrop and room for 1,500; and the Amphitheater, which offers terraced seating for 2,000 against a wooded backdrop. “You could invite a small town to come to your wedding,” Bube said. 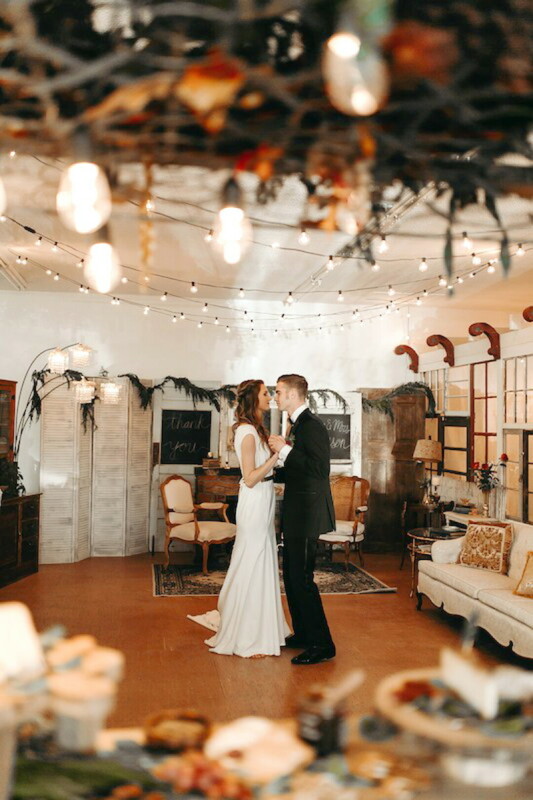 As its name implies, Sweet Legacy Vintage Rentals offers a plethora of vintage items that can be rented to decorate wedding receptions, photo shoots, or other occasions, ranging from Victorian furniture to classic tableware, linens, and lighting. “Our goal is to make (brides’) Pinterest boards come alive,” owner Tammy Hurt explained. She and her daughters Sarah and Molly can set you up with elegant (and fashionably mismatched) china, umbrellas, suitcases, globes, vintage Thermoses – you get the idea. But Sweet Legacy isn’t just about outfitting your wedding: The business also offers an intimate venue perfect for a small reception, rehearsal dinner, photo shoot, or bridal shower. With the help of windows and trim from historic homes, a portion of the building has been transformed into a charming space that can seat up to 40 people. Those who rent it can cater in their own food and dine on farmhouse-style tables with vintage china and linens. Outside the private venue is a cozy, eclectic lounge area that’s perfect for taking photos. In addition to renting almost anything you could need for a wedding, Sweet Legacy will soon begin selling wedding goods on consignment, which means you will now have an easy way to sell off the 30 centerpieces that have been in storage since your own ceremony!